Shady's back. 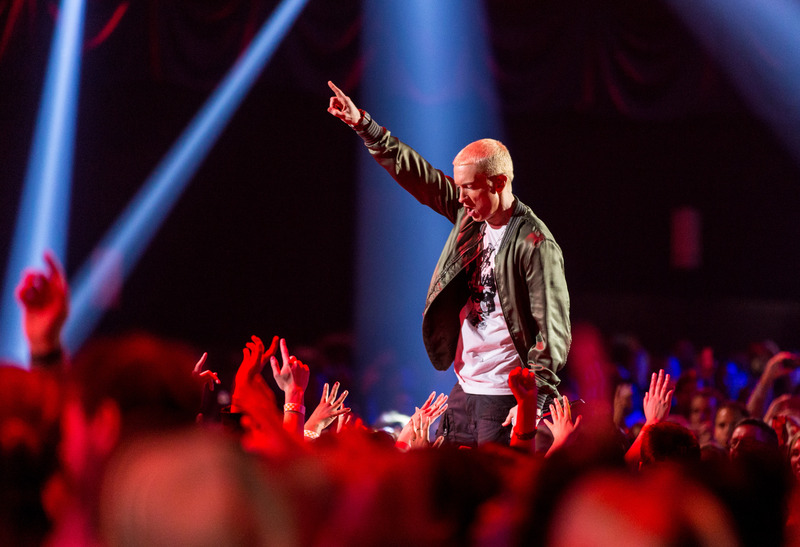 Following the release of his new single "Guts Over Fear" featuring Sia on Sunday night —which is awesome, by the way — Eminem announced his new album SHADYXV . The two-disc album is set to drop on Black Friday, Nov. 24, and considering how great his collaboration with Sia went, it's going to be one of his best yet. According to the official release, one disc of SHADYXV will feature Shady Records biggest hits — think "In Da Club" — and the other will carry new music from Eminem and a handful of guest artists including Yelawolf and D12. Really, the prospect of more "In Da Club" is enough to sell me on this. Along with the announcement, Eminem released a 20-second teaser video for SHADYXV on Twitter, with a tweet that said, "It's official." The video flashes through what looks like the album covers of all the albums that Shady Records has released since it was founded in 1999, all in black and white, while the music to 50 Cent's "Patiently Waiting" plays over it. And, it'll absolutely make you feel nostalgic for the days before 50 Cent joined Instagram and insulted women everywhere.